Many of the most magical scenes and beautiful times at America's First House begin right after the president pardons a huge turkey in the Rose Garden. The first lady dresses up, not too much, after our national day of giving thanks and stands in the driveway to receive a Christmas or Holiday tree that goes into the Blue Room because its the official one. 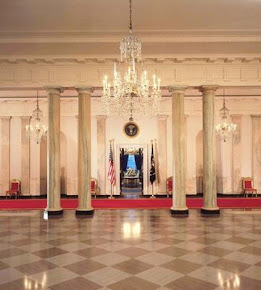 Next, the family scampers off for a couple of days while hordes of pre-screened festive volunteers turn into White House elves with direction from the Ushers office and decorate more than a dozen trees, the State Rooms, the Truman Balcony placing garland, ribbons and bells everywhere. Pat Nixon resuscitated the use of wreaths as decorations for the Holidays. Bo's curiosity is going to be quite hard to control. It's almost a sure bet that when President Obama lights the National Christmas tree, which is seen from The Washington Monument and the Truman Balcony, that it will be Sasha pushing the button. The selection of the tree is political. From which state does it originate (can't have one state furnish the tree year after year complete with much care to ensure it is not an old-growth tree. Like a sports team, the trees are scouted for height (usually 20 feet tall), color suitability and the density of its branches to take the weight of lights and many handcrafted and heirloom ornaments sent to the White House for just this holiday. Mamie Eisenhower decorated 27 trees in 1958. Jackie Kennedy introduced the idea of theming the decorations. For the Carters last year in 1980, it was a Victorian Christmas. In 1994, Hillary Clinton had great fun with the Twelve Days of Christmas. A catalog of each of the ornaments must be made. But the incredible dinners, bountiful buffets and cookies need planning as well. The tremendous amount of floral work need careful scheduling as the refrigerated room to keep blooms fresh is rather small. Add to the fact that the Chief Floral Designer, Nancy Clarke, retired her pruning shears in May, brings more tension to this first Holiday. If asked, many retirees with special skills return to help out during this time. For under $17, excluding shipping, the official 2009 ornament will be sold exclusively via the White House Historical Association. Grover Cleveland is the object of this years version. President & Mrs. Frances Cleveland had toddlers in the White House for his second term. Snow capped rolling lawn with frosted trees gazing at the majestic South portico is the view on the ornament from an eastern angle. Margaret Huddy is the watercolor painter chosen to render the images. This is the second ornament to feature the nineteenth century during the Clevelands terms in office. President & Mrs. Reagan did a modest engraved gold angel blowing a trumpet in 1981. That marked the first time ornaments were offered to support the WHHA. The ornament selected is always featured on the tree in the Blue Room. Christmas parties are traditional for staff, Congress, the press and family among meeting diplomats and other soirées. Tours go up as the rooms are filled with elaborate gingerbread houses and holiday treats. 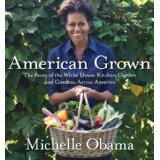 As this year will be the first for the Obamas in the grand old house, planning the first one is a full time event. There is no question that it will get lavish press attention and television time as well. Sasha & Malia have already put sleds to good use on the South Lawn, but this year will see their imprint on the decorating. It's all in the planning and the volunteer elf army. Update: Michelle's First White House Christmas Tree - it explains the selection process and shows other First Lady's Christmas trees. I know this post is old but hopefully you will read the comments anyways. This could be a monumental year as a Santa usually entertains during some part of the holidays. Will the Santa this year be a "african american/black" santa? That could really shake up america. Hello Rebecca! Thank you so much for the comment. had not thought through the Santa Claus, but did smile at the image of President Obama reading Twas the Night Before Christmas. Keep tuned there is something coming shortly about the official WH Christmas Tree. Hello--I came across your blog when I googled "volunteer to decorate the White House for Christmas." I am an interior design major recently moved to VA who would love to help decorate the White House for Christmas. Do you have any idea how to go about doing this? Do you know when it's done? Thanks in advance for any information you can give me. This is a very interesting blog! Thank you Elaine! We get intersting books from the library to help us make it fact filled. Going forward we will seek donations to help us build a library of books since our time is so limited, but the subject(s) so wonderful for both of us. Many of the volunteers come via local garden clubs in Virginia & Maryland. Many of the decorations have floral components and a good many of the Volunteers come from all over the country - check with your Congresspersons too. Security is tight and screenings need to be complete early enough to get those White House jingle bells going right after Thanksgiving. I hope you do and we;d love to welcome you back to tell us all about an amazing experience. It's a wonderful mad house to get all the trees trimmed (more than two dozen), wreaths up and ornaments cataloged and displayed! House at Christmas this year?